Agricultural activity associated with habitat conversion is becoming the major driver of biodiversity loss across the tropics [Laurance (2014) Trends in Ecology & Evolution 29:107-116]. The decline of species richness is a common outcome of conversion to agricultural land-use, but the associated changes in functional and phylogenetic diversities as well as spatial patterns of beta-diversity are not well understood. These patterns may shed light on underlying ecological processes that are of both basic and applied interest. For example the relative roles of ecological filtering or stochastic assembly of structuring ecological communities in agroecosystems. Therefore, I would like to investigate the effects of conversion to rubber plantation on ant taxonomic, functional and phylogenetic diversities at local (alpha), among-sites (beta), and landscape (gamma) scale. In human-modified world, human-induced disturbance such as deforestation and agricultural activities can and do dramatically influence the pattern and distribution of genetic diversity within species, and therefore can have important consequences at species, communities and ecosystems levels. Using ants as my study system, I aim to understand how the influences of human-induced disturbance influence the patterns and distributions of ant genetic diversity. Furthermore, I seek to understand the ecological consequences of the genetic effects affected by disturbance. These results will help us to predict the responses of populations and communities with different level of genetic diversity influenced by disturbance and can have important applications in conservation and restoration planning. Phylogenetic community ecology have an important advance to examine whether communities are largely shaped by niche-based assembly rules or by neutral processes [Cavender-Bares et al. (2009) Ecology Letters 12:693-715]. A reliable and high resolution phylogeny is very important for studying phylogenetic community ecology, however current level of phylogeny resolution generated by DNA barcodes may still not be enough. My primary goal in this study is to increase knowledge of phylogenetic patterns and assembly of ant communities in agroecosystem. By using next-generation-sequencing (NGS) technique, for the first time, I will generate a large reliable ant community phylogeny with more accurate ant phylogenetic structure, which will give us a better chance to test the hypotheses of community assembly in agroecosystem. 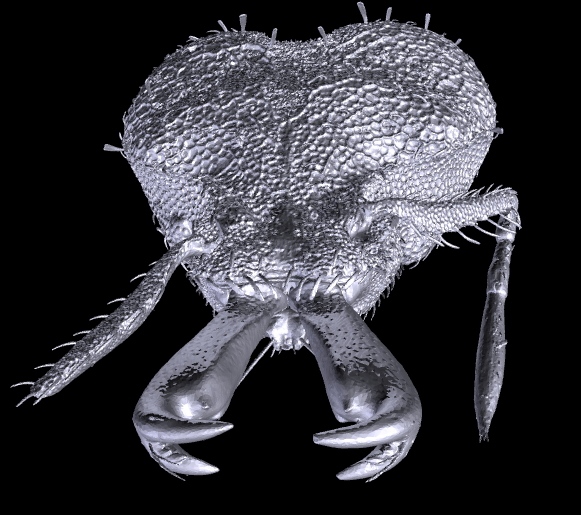 By using X-Ray micro-CT, I am interested in 3D reconstruction and visualisation of ants for ant taxonomy. In the meantime, I am also interested in studying the evolution and functional significance of ant morphology (e.g. evolution of ant mandible).